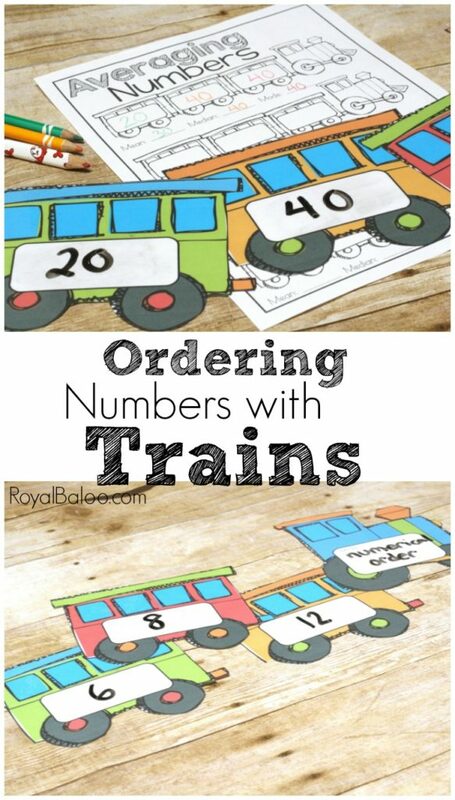 Practice Averaging and Ordering Numbers with Trains! I have the harder time finding fun work for my older kids (especially Baloo, at 10). Sometimes he just wants something fun like his brothers! But if I make something just for him, I have two younger kids begging to join in. So when I can put something together that they can all use, it’s almost like utopia. 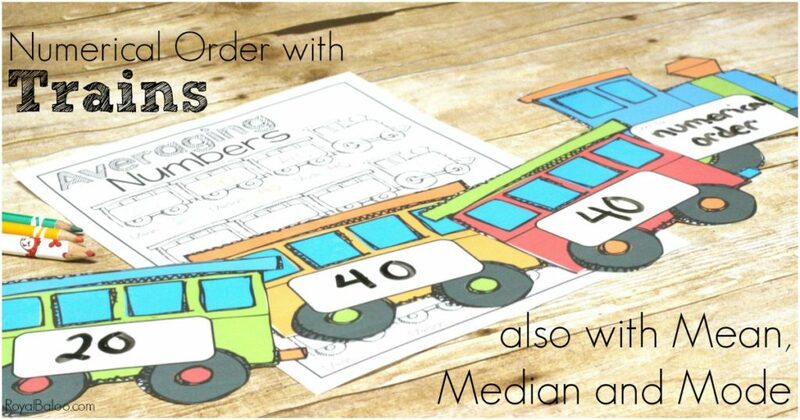 These transportation ordering cards are so versatile. But we are using them for numbers, primarily. I might use them for ABC Ordering…we will have to see. 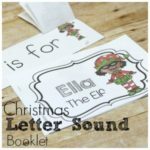 This is a part of my 31 days of printables! We are now officially halfway through, although I’ll be a bit sad when it’s all over. I hope you’re enjoying it though! Baloo (10) is starting to work on averaging. I’d like to do some really hands-on activities with manipulating gems or tiny erasers to show what averaging actually means. In the meantime, we have trains! He used to love trains so much! Now he’s more interested in how trains work, but the idea of trains still gets him excited. To find median, it’s important to line up the numbers in order. So that’s kind of the focus of this activity. It also helps with mode and seeing all the numbers next to each other. I only printed 3 train cars to begin with, but you can print as many as you need! In fact, you’ll probably want at least a few more if you’re going to work on mode. 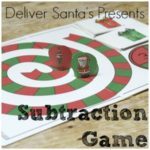 I laminated all the pieces and would have used cardstock if we hadn’t run out. All of the boys love trains and I know we will use these often. The lamination is important so you can write the numbers! 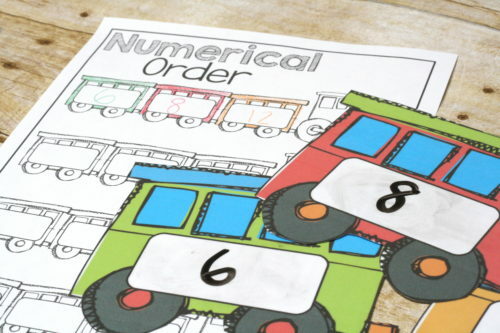 Of course, you could write the numbers before laminating if you’d like just one set of numbers. I have so many ways I intend on using them and didn’t want to have to print multiple sets. I figured blank sets were the way to go! There are two recording sheets – one for averaging and one for just putting in numerical order. This one has a space for mean, median, and more. This recording sheet just has a space to put the numbers in order! For the younger boys (Royal 7 and Logi-Bear 5) I just wrote numbers. I did higher ones for Royal, but this was for Logi-Bear. Then it was his turn to put them in order. I encouraged them to have the lower numbers on the left since we read left to right, but I wouldn’t be too strict on this. The important part is that understand which numbers are the lowest. We didn’t record all of the ones we did. I think the recording sheet is fun for kids who like to write and color. But it’s not necessary for everyone! 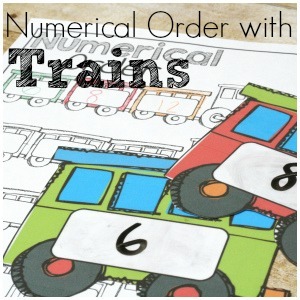 Go Here to Download the Order Numbers with Trains Set!